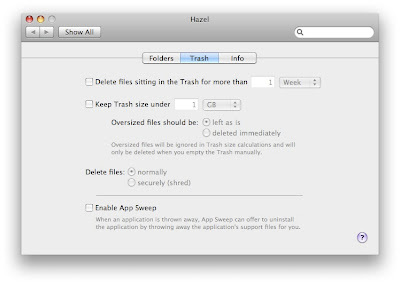 A New Mac Tip Every Day: Review: Hazel! Hazel is part of the MacUpdate 10 applications bundle. 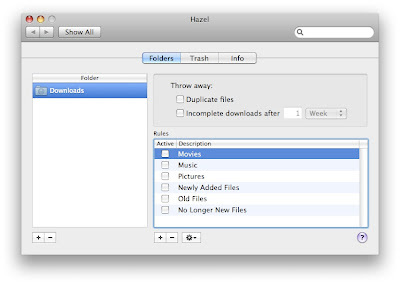 Hazel is an application that helps keep everything organized on your Mac without running in the background or having any icon in the Dock or the Command - Tab dialog. It hides in the System Preferences. It basically lets you keep everything organized using rules. It includes defaults rules that you can enable as soon as you install it and it really gives you a good idea of what it does. An example of what it can do is automatically add color labels to downloads according to the kind of files (movies, music, pictures, etc). You can also choose to automatically empty the trash at a preset interval. The application is extremely flexible and lets you do a lot without a more complicated interface like automator. If you don't know if it is an application for you, the best thing is to check out the trial version. You can learn more about the bundle, try out the applications or buy the bundle here. Don't forget to check out the tip posted earlier today. "Arrange in Front" in Safari!